Incensed Longlands August 9 bonfire builders were so angry at a business taking back stolen pallets that they phoned the firm’s head office to complain. Around five workers with a lorry moved onto the site to take back a number of pallets that had been stolen the previous evening. A worker told the North Belfast News their premises had been broken into overnight and the pallets stolen. Around five workers from the firm, which did not want to be identified, spent around an hour loading a lorry with their property. They were visited by their boss onsite who informed them that a complaint had been made. Around half the pallets on the site were removed. The remaining pallets are blue, which identifies them as being owned by the supply firm CHEP. They have stated they do not sell pallets. The North Belfast News asked two bonfire builders present when we visited the site if the pallets were stolen, which they denied. They did, however, admit the pallets being removed by the workers had been taken illegally. They hit out at the North Belfast News calling the paper “Brits” and justifying their building of the bonfire. Support for the Longlands bonfire appears to be split with a wider level of support for the blaze than in areas like the New Lodge. Last year local families were seen at the blaze and a DJ booth was set up with power being supplied from a local home. Sinn Féin councillor Michael Goodman said he had been contacted by residents who say they don’t want the bonfire built under any circumstances. He said he was trying to find out who owned the land on which the fire was being built. 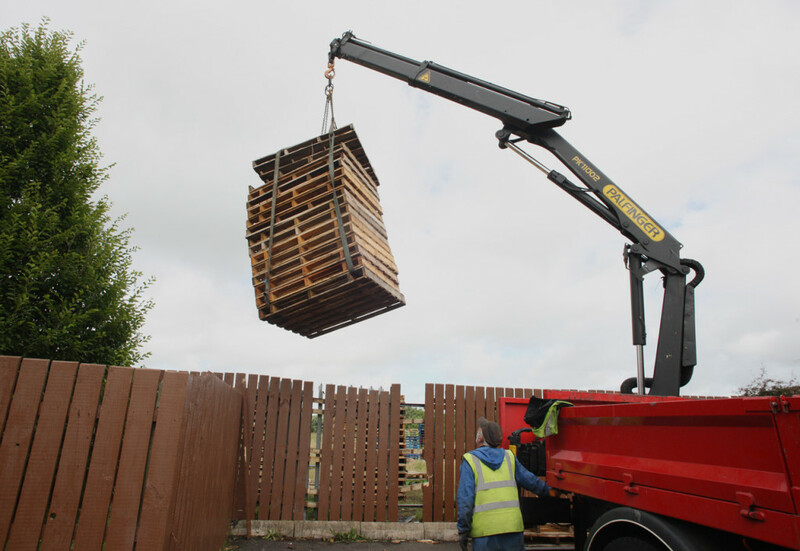 Speaking after having contacted local agencies to raise concerns about a build-up of bonfire materials in the Longlands area of Newtownabbey, Councillor Michael Goodman said: “Unwanted bonfires must be dealt with effectively by the statutory agencies responsible. I have raised the concerns of local residents about this accumulation of bonfire materials in the Longlands area of Newtownabbey today. “Some residents are quite concerned about a bonfire being built close to properties in the area and the accompanying anti-community behaviour associated with such gatherings. “I’ve written to the Housing Executive about the land in question and contacted the PSNI to raise my concerns. “We have seen in other areas of Belfast and Newtownabbey gangs of youths gathering stolen materials to burn and those materials should be returned to their rightful owners.